Next Wednesday Marian Seldes and Sloane Shelton will read from Eudora Welty‘s short stories at New York’s Symphony Space; the reading will be recorded for NPR’s “Selected Shorts” series. We’re in for a lot of Welty-related stories soon, given that next year marks the 100th anniversary of her birth. If you’re a Welty scholar, you’ve just missed the deadline to contribute to Mississippi Quarterly’s dedicated issue on her, but you have about another month to catch an exhibit of her photography at the Pearl Public Library. My one brief stop in Jackson a couple years ago was too brief for me to visit the Eudora Welty House (though I was there around St. Patrick’s Day and the town was fit to burst with Jill Conner Browne fans.) 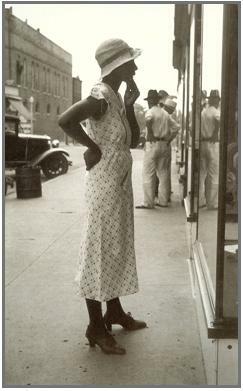 Visiting the house’s Web site reminds me that she was a fine photographer as a well as a great short-story writer; the Welty Foundation sells the photo you see here, Window Shopping, as a fundraiser for its efforts.